Riverton High School sophomore Jessika Lawrence (right), watches alcohol turn to a gaseous cloud in a bottle. Michael Huntington of Littleton, Colo., a UW graduate student in mathematics, looks on. It was one of six experiments performed during a recent science academy for GEAR UP Wyoming students at Central Wyoming College. Three University of Wyoming students put some “pressure” on high school and middle school students from Riverton and Lander recently. The science kind, that is. 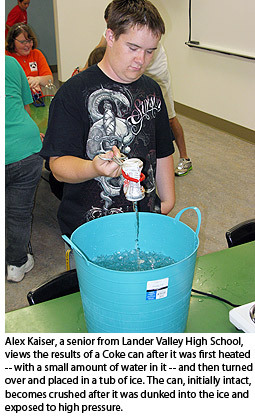 At a science academy event at Central Wyoming College July 17, a group of GEAR UP Wyoming students was exposed to a number of science experiments that centered on the effects of pressure, specifically how high and low pressure interact. To understand this unique interaction, they pumped air into an enclosed glass and watched the rubbing alcohol inside transform into a white gaseous cloud. 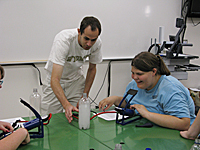 In addition, the students guided ping pong balls, with the use of a hair dryer, through different lengths of clear, plastic tubes; watched heated pop cans (with a small amount of water inside) crushed instantaneously after dunking them into a tub of ice water; and attempted to blow up a balloon located inside a plastic bottle. Alex Kaiser, a senior from Lander Valley High School, enjoyed watching the metamorphosis of the aluminum cans and surmised that the high pressure from the ice moves to the low pressure inside the can. He was correct, based on Nels Frazier’s explanation. The educational outreach program, part of the National Center for Atmospheric Research (NCAR)-Wyoming Supercomputing Center (NWSC) partnership, is designed to expose income-eligible students in Wyoming to atmospheric and computational science, and potential career opportunities in those fields. The NWSC facility in Cheyenne is slated to open this fall, with a number of UW faculty scheduled to use the supercomputer to model their research. Previous science academy collaborations between the University Center for Atmospheric Research (UCAR) and GEAR UP Wyoming, with an assist from UW students, took place during June at Western Wyoming Community College in Rock Springs and Northwest College in Powell. In all, about 250 middle and high school students attended the academies. To get the GEAR UP students warmed up and thinking like scientists, two groups were provided a cube with different colored sides. Each side of the cube included a name of a person and numbers in opposite corners. The objective of the exercise was to discover the links between the names, the colors and the numbers to determine what information appeared on the bottom, or unseen side, of the cube. The students quickly figured out female names appeared on red sides of the cube while male names dotted the white sides. It took a while longer, but the students eventually determined one of the numbers represented how many letters were in each name and the other number represented how many of the letters were the same to start each name. For example, the name “Frank” served as a clue to determine the name, “Francine,” was located on the bottom of the cube. In another critical-thinking drill, which took place outdoors, some students acted as scientists and watched the other group create movements, much like cells under a microscope. The scientists’ objective was to determine the rule the movement group was following. In one case, scientists determined that those they observed had to keep their distance from each other and keep moving, but had to stop momentarily when a certain person in the group crossed in front of them. “If you look at a chemical problem, this is what you would be thinking like and about,” Frazier says. Students learned that, in many ways, a supercomputer is much like a superhero. It may not be able to leap a building in a single bound, but it certainly could be argued it may be faster than a speeding bullet. Huntington explained that the NWSC is so powerful that it’s comparable to every citizen in Wyoming calculating 3 billion computer operations per second simultaneously. The NWSC will contain some of the world's most powerful supercomputers (1.5 petaflops, which is equal to 1.5 quadrillion computer operations per second) dedicated to improving scientific understanding of climate change, severe weather, air quality and other vital atmospheric science and geo-science topics. The center also will house a premier data storage (11 petabytes) and archival facility that holds irreplaceable historical climate records and other information. To simulate models a supercomputer might run, students inputted different numbers on desktop computers to determine at what density percentages a simulated wildfire would spread more rapidly. Such a model could provide clues that could aid firefighters in tackling a fire, Huntington says of a topic that has been in Wyoming’s daily news since early June. “I hope they go away with an understanding of how high pressure goes to low pressure, and that a supercomputer is fast and useful,” Huntington says. “It was pretty much all fun,” says R.J. Salazar, a student at Riverton Middle School. The NWSC is the result of a partnership among NCAR; the University of Wyoming; the state of Wyoming; Cheyenne LEADS; the Wyoming Business Council; Cheyenne Light, Fuel and Power; and the University Corporation for Atmospheric Research. NCAR is sponsored by the National Science Foundation (NSF).